Ontario fly-in fishing with Canada Outfitters for walleye, pike, bass and trout. Ontario fly-in fishing at a secluded Northwest Ontario fly-in fishing outpost. There are no neighbours. If that sounds like what you're looking for then we have the place for you at Brown Bear Lake fly-in fishing Outpost in Northwest Ontario. Brown Bear lake is part of the famous English River System. 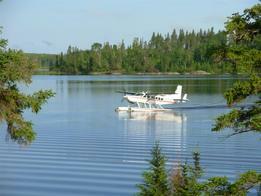 We will fly you from our seaplane base in Kenora to our deluxe, three bedroom fly-in fishing outpost cabin. This Ontario fly-in fishing cabin is nestled next to the woods, on a point, with a spectacular view from the wraparound deck of Brown Bear Lake outpost. Our fly-in fishing outpost cabin is accessible only by float plane, and you will be the only one fishing on Brown Bear lake. You'll have complete fishing privacy --NO NEIGHBORS! 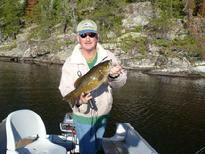 Brown Bear Lake offers excellent fishing for Smallmouth Bass, Northern Pike, Walleye and Lake Trout. This Ontario fly-in lake has short portages to three other lakes for more outstanding Northern Pike, Smallmouth Bass, Lake Trout and Walleye fishing.... these Northwest Ontario Trophy Waters can't be beaten for unlimited fishing opportunities. Due to ongoing Conservation Fishing Practices over the years, this fly-in fishing outpost lake continually produces an abundance of high quality fisheries. The scenery on the lake is awesome and wildlife is abundant. The Brown Bear Lake system is considered to be one of the best Ontario fly-in trophy Smallmouth Bass fishing lakes in the Northwest Ontario Trophy Waters area. The Smallmouth Bass in this lake average 2 to 3 pounds. Four pound fish are common, and trophy wall-hangers (5 to 6 lbs.) are produced every season. Now you would think that would be enough fishing to keep you busy, but we have got more Portage Lakes. In fact there are Three of them! The first portage lake is a 4 minute walk from Brown Bear Lake to the back waters of Midway Lake where three boats and motors are waiting for you. You carry only your fishing rod, and maybe your shorelunch for the day. By boat, you can travel from Lower Midway Lake to Upper Midway Lake through a scenic waterway about 5 miles long. Both of these fly-in portage lakes have the fast action Smallmouth Bass and Northern Pike fishing you are looking for. Many of our fishing guests report Moose sightings in this area. Now if you are not too tired, we have another portage (4 minute walk) from Midway Lake to Beauty Lake. Beauty Lake is our fighting Lake Trout fishing destination, along with some more of the nicest Smallmouth Bass fishing that you will ever encounter. Beauty Lake is clear water. From here we have one more portage lake for the devoted Walleye Fisherman. The trail is located at the northwest end of Beauty Lake and it is not for the weak-hearted. We have boat, motor and fuel at this last portage lake so you can just bring gear and your lunch to do some great walleye fishing. The portage trail crosses through an old logging cut so you might stop for a few blueberries, when in season. This is a dark coloured water and it produces some great fish. Not many people venture this far, so it has limited fishing pressure all season. outpost has tongue and groove pine throughout. All fishing boats are 16-foot Lunds with raised swivel seats and new Yamaha motors. We also provide life jackets, paddles and bait buckets for your fly-in fishing trip. This is an excellent fishing camp for large groups, with lots of water to fish and explore, as well as excellent fishing throughout the season. Although remote, you're not alone. We fly in and check on all of our fishing guests every other day (weather permitting) to ensure all is well and to bring in additional bait for fishing or supplies as needed. This really is a wonderful Canadian fly-in outpost fishing holiday whether you're an avid fisherman, or just want to get away and relax for awhile, enjoying the great outdoors with family and friends. Please call or E-mail us anytime if you would like additional information or references. We will be happy to answer any of your questions. Nothing beats a summer getaway at one of our remote fly-in outposts. Problem is, some of you spend the better part of two days or more on the road just getting here and back again. Problem solved . . . For guests wishing to save travel time, you can now fly directly to Winnipeg, Manitoba or International Falls, Minnesota. From either airport we are only 2-1/2 hours away. 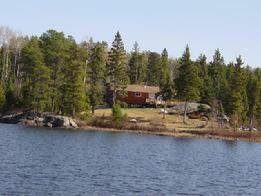 Many of our guests rent a vehicle or use a van service for the last leg of their trip into Kenora. Because all flights to our fly-in outposts are scheduled for early morning, guests flying into our area via commericial air carrier or private plane should arrive on the day before their scheduled fly-in outpost trip. For current flight information and any other travel arrangements (hotel, rental car, van service), please call Prelude Travel at 1-800-561-8907 or 1-807-468-1928. Be sure to ask about the special "Fisherman's Fare".